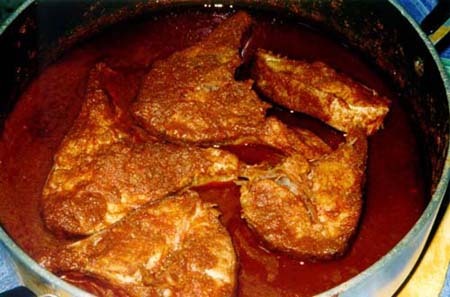 A spicy fish, often served as an appetizer before a holiday or Shabbat meal. Heat the oil at low temperature. Mix together 1/2 cup water, lemon juice, tomato paste, salt, the garlic, cumin seed and the optional chili and add to the oil. Simmer over low heat for 10 minutes. Add the fish and the remaining water. Cover the pan and cook over low heat for 15 minutes.